I came across this article today. I think you’ll find it fascinating. 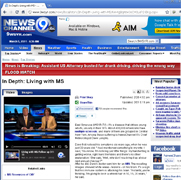 It’s a discussion of how MS affects a prominent weather man up in New York. It’s actually good to watch. He has a good sense of humor, but he talks about the symptoms of shakiness in his hands…one hand more than the other. He can’t brush his teeth without throwing his toothbrush. He can’t shave with his left hand. The article, as well as other articles on the topic, discusses that handwriting is affected with MS and other neuromuscular diseases. East Syracuse (WSYR-TV) – It’s a disease that strikes young adults, usually in their 30’s. About 400,000 Americans have multiple sclerosis, and many of them are grouped in Central New York. Among those suffering is NewsChannel 9’s Chief Meteorologist Dave Longley. After he did, Dave’s doctor sent him for an MRI. The resulting images showed white areas – lesions – on his brain. It’s a sign that his immune system is attacking his brain. “Instantly, you’re thinking, I’m going to be in a wheelchair in 10, 15, 20 years,'” he said. If the diagnosis had come 20 years ago, Dave might have been right. There was previously no medicine for MS. Today, however, there are drugs that can slow down the disease. Once each month Dave gets an infusion of Tysabri. The medicine has helped with his fatigue, but another symptom has worsened – his speech. “Its becoming obvious, if I could keep it hidden, I probably would just go about living my life and it’s no big deal,” he said. East Syracuse (WSYR-TV) – Central New York is one of the hot spots in the U.S. for Multiple Sclerosis, a disease in which the body’s immune system eats away at the protective sheath that covers the nerves. There may be more people suffering in CNY and in the Minnesota/Wisconsin area than anywhere else in the U.S., according to Upstate Hospital Neurologist Dr. Burk Jubelt. Also, the National MS Society also cites Rochester as a location in which a cluster of cases was identified. The Mayo Clinic reports that the risk of MS seems to increase with latitude. In fact, the reason for the particularly high rates of MS in CNY may be the relative lack of sunshine. Low levels of Vitamin D were linked to MS by a study in the Public Library of Science Genetics Journal. Additionally, women are more vulnerable to the disease. Seventy percent of MS patients are female, and they get it younger than men. The immune system starts attacking the brain at the average age of 30 in females, while men are more likely to get MS in their 40’s. Family history is also a potential risk factor. While the normal risk is just one-tenth of one percent, someone whose parents or siblings develop MS have a 1-to-3 percent chance of developing the disease. Additionally, certain autoimmune diseases, including thyroid disease, type 1 diabetes or inflammatory bowel disease increase the risk of developing MS. Early symptoms include tingling and numbness in the hands, arms, legs or feet. The disease can also cause acute vision loss, causing things to look blurry or dark. There’s often a pain in the eye. Patients also report weakness on one side of the body, usually in a leg. As the disease progresses, further symptoms include balance problems, tremors, extreme fatigue and bladder problems. Eventually, people with severe cases may lose the ability to walk or speak. There’s no cure for multiple sclerosis. However, the National Multiple Sclerosis Society says some treatments can help treat attacks, modify the course of the disease, improve function and safety, treat symptoms and provide emotional support. In combination, these treatments enhance the quality of life for people living with the disease.